I'm Ros and The Land Down Under - Australia comes from my fascination for our native Wildlife, Australia itself and the fun and adventure of travelling through it. I've often been asked "How did The Land Down Under start"? Well, I'm sure it started way back when I was a kid. I was fortunate enough to be shown the beauty of Australia and it's wildlife from a lot of travel early in life. The respect, appreciation and admiration for this beautiful and rugged land and its unique wildlife I'm sure started back then. I was around 5 years old when my family headed off from central Victoria, across the Nullarbor Plain for Kalgoorlie in Western Australia in an old Holden station wagon. 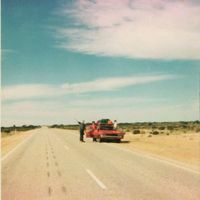 At that time, the road across the Nullarbor itself was still dirt in a lot of places and was 'rough' at times. We had spare tyres on the roof rack and jerry cans with extra fuel and water, vinyl seats, no air conditioning (unless we wound the windows down! ), Grandparents, parents, 2 kids and the entire luggage in the car as well. It really was an adventure! I can still remember some parts of the trip even though I was so young. I remember - when it was still permitted - sitting in with the luggage in the back of the station wagon (it was actually quite comfortable!) crossing the Nullarbor while it was flooded. Being a little kid, I remember pretending I was in a boat and I was having a great time! Cars (what there were of them at that time) were being pulled across fast flowing areas with tractors. Traffic at that time was pretty scarce. I know when we did see another car or truck heading our way, we would all be hanging out the windows waving to them - but the funny thing was, so would the people in the other vehicles! When we would stop for a break on the side of the road, usually a truckie would stop to check that we were ok, only to find that we were ok and just having a 'cuppa'. Often the truckie would pull out his cup and have one with us! It was terrific; we would all sit for ages talking about the road ahead, what we'd seen, what we could see and more. The wildlife at that time was amazing! You didn't dare drive at night for the kangaroos - hundreds of them, even a few camels made an appearance. Eagles soaring above us during the day were great to watch too. We met a truckie who had stopped for dinner at the same truck stop as us, but he had a special friend with him, a joey kangaroo! I had to get closer to have a better look. The truckie gave me the joey to look after while he ate his dinner. The truckie saved the joey after he'd hit and killed the mother kangaroo - he was taking it to get it some help. He named the joey 'hamburger'. Why hamburger? He said if he left the joey behind that it would be hit by another truck and flattened like a hamburger. That was an amazing experience for me - a big tough truckie saved this tiny little roo. I was hooked on wildlife from that moment on. I'll never forget little hamburger. As for the wild flowers, they're just brilliant. The Sturt Desert Pea was my favourite. It was in such masses that it was like a brilliant red carpet, just laying out across the sands. I remember a large above-ground pipe that carried water (and still carries water to this day) across the country. No matter how long we had been driving, that pipe was always there - right alongside us. We had to eat cereal with frozen milk at the motels across the Nullarbor. I can tell you, Cornflakes have never been so crunchy! Milk had to be frozen because of the distances between places and it could be a long time between deliveries. I can still remember in Kalgoorlie, most of the roads then were dirt, not many were bitumen. A lot has changed on that road since then. Since that trip, I have travelled many, many thousands of kilometres on holidays and even just weekends when we can get away from it all. Travel is now a big part of me and my family. At the time of that trip, I was privileged to see Australia ' back then'. Before so much of it was changed to accommodate the tourist trade. We as a family have been fortunate to be able to travel literally thousands of kilometres throughout Australia. There is so much to see, do and experience. So many people do not get to see, do and experience what we do, and so through The Land Down Under, I hope that they might just get a preview of what travelling Australia - The Land Down Under is like and the wonders that it holds. I can only hope that you will be inspired to want to venture into The Land Down Under and experience all its wondrous sights, landscapes, oceans, wildlife and more - for yourselves. This truly is a remarkable country. Have fun and who knows, maybe we'll meet one day on the roads for a cuppa!